Awards for Nina Roth, Daniela Saadeh and Boris Leistedt! Royal Astronomical Society Prize for Boris Leistedt’s PhD thesis New Session, Hellos and Goodbyes! The summer has brought some well-deserved recognition for EarlyUniverse.org researchers! Nina Roth received the best poster prize at a major summer symposium held at the European Southern Observatory headquarters in Garching, Germany, titled “Theoretical and Observational Progress on Large-scale Structure of the Universe”. 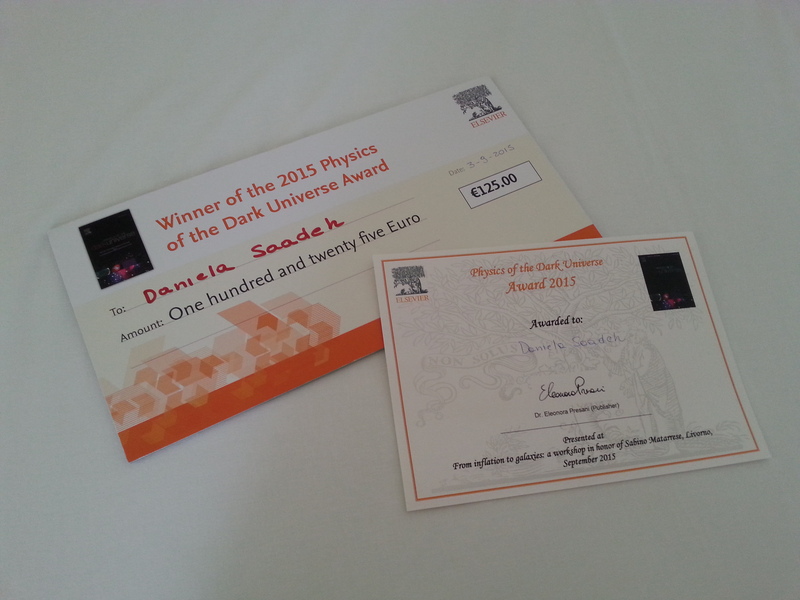 Daniela Saadeh has received the 2015 Physics of the Dark Universe Award at the conference “From Inflation to Galaxies: a workshop in honor of Sabino Matarrese”, which came accompanied by a fun giant cheque! Meanwhile Boris Leistedt, whose thesis previously won a prize from the Royal Astronomical Society, has been given a nice parting present from UCL as he begins his new position as a Simons Fellow at New York University. He has been jointly awarded the Jon Darius Memorial Prize for 2014/15, for Outstanding Postgraduate Research in Astrophysics.